Welcome to Battlefield NM! 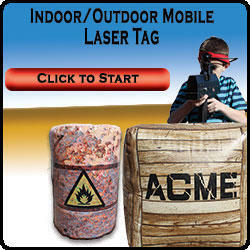 We are New Mexico's Only Company Specializing in Outdoor/Indoor Mobile Laser Tag! Battlefield New Mexico - Laser Tag Party Rentals...Live the Game! Welcome to Battlefield New Mexico! If you've ever played laser tag, you know it's a blast! Battlefield NM has taken the fun of laser tag, and kicked it up a notch! Now, instead of having to go to a set location, wait in a long line, and play for 5-10 minutes, you can have the fun and excitement of laser tag delivered straight to your front door! Battlefield NM is New Mexico's ONLY indoor/outdoor mobile laser tag rental company! Whether you're planning a birthday party, church youth group, or even a corporate event, Battlefield NM can provide the time of your lives. How do we know? Because our customers keep telling us things like, "This is way more fun than that place that I usually play!" With Battlefield NM's state-of-the-art laser tag, you can still play indoors and use walls, halls, and doorways as barriers. Or, we can provide bunkers and barriers and you can play outside too! Either way, you'll be sure to have the time of your life! With mobile laser tag, teamwork is the name of the game. You will work together to master games like "King of the Hill", "Capture the Flag", and everyone's favorite "Team Deathmatch". That's right. It's just like bringing the fun and excitement of the video games to real life! Are you ready for the best part? It's pain-free! Unlike paint ball rentals that shoot hard objects at very high rates of speed directly at people, laser tag rentals provide hours of fun with no actual projectiles! Have all the fun of paintball with no pain! Planning a party has never been easier. Select Order By Date (Above), and then choose the package that's best for your needs. You can even rent our giant movie screen and have a movie night! If you're planning a small birthday party, and are inviting about 10 guests, you may want to rent our Veteran Party or Platoon Party. If you're planning a large event and inviting 20+ guests, you may want to consider the "Tactical Nuke Package" which comes with taggers for 20 guests as well as the giant movie screen. Of course, you can select a package and add additional taggers as needed to make sure everyone has the time of their lives! So what are you waiting for? Whether you're a parent planning a unique birthday party that's different from the norm, or a pastor scheduling a youth group special event and looking to do something different than before, Battlefield NM is all you need to have a unique party rental experience. Grab a group of friends and battle it out to see who will earn bragging rights!